Multifocal contact lenses are designed to correct eyesight affected by presbyopia. These contact lenses provide a far more convenient alternative to traditional bifocal or varifocal glasses. We stock a wide range of multifocal lenses with our bestselling lens being 1-Day Acuvue Moist Multifocal. To buy multifocal contact lenses click the products tab to explore our range. If you're unsure which lens will suit your eyes scroll to the bottom of this page to see our most popular multifocal contact lenses. 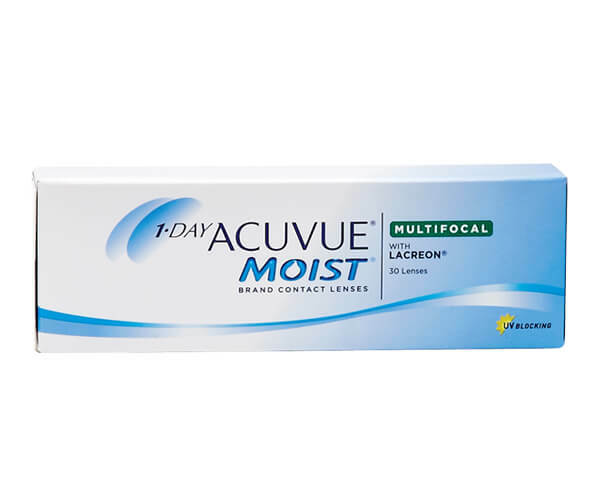 1 Day Acuvue Moist Multifocal by Johnson & Johnson is our bestselling multifocal lens. 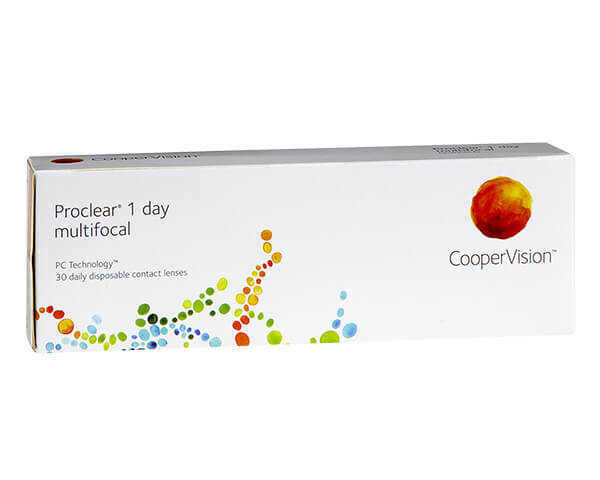 In 2018, 17% of multifocal wearers on VisionDirect.co.uk purchased this product to correct their vision. So, why do so many people rely on 1 Day Acuvue Moist Multifocal? It's because many wearers believe it's the most comfortable multifocal lens available. All day comfort is the number one concern of contact lens wearers and it's the main reason why some new wearers do not get on with contact lenses. So, you'll be reassured to know that many wearers rate this lens extremely highly for its unparalleled comfort levels. If you have never worn multifocal lenses and you've just recently noticed a change to your vision, it is comforting to know that multifocal lenses are an option, there's no need to stop wearing lenses and change to glasses just because of you are over 40. Give 1 Day Acuvue Moist Multifocal a try today, there's nothing to lose, in fact, there's so much to gain: comfort, improved vision close, near and far, plus the freedom of not needing to fuss with glasses. Multifocal contact lenses are made with multiple prescriptions built into a single lens. They help the wearer to focus on objects up close, at intermediate distances and further away. This convenient configuration is effective for treating presbyopia, a common age-related eye condition. The combination of near and far correction in one lens means users don't need to take reading glasses on and off every time something at a different range is viewed. 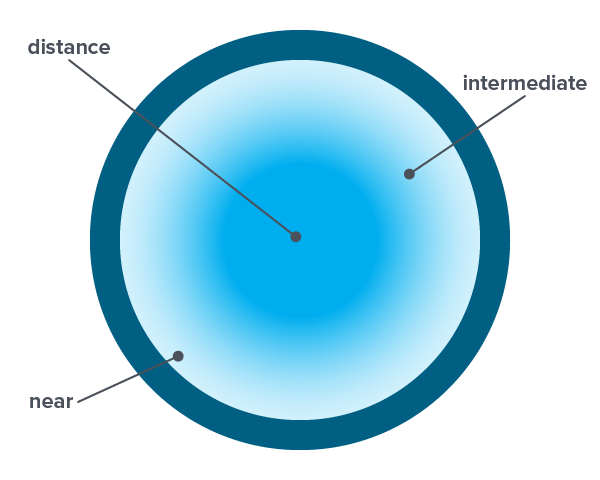 The terms 'bifocal', 'varifocal' and 'multifocal' lenses are often used interchangeably, which can be a little confusing. While varifocal and multifocal lenses are the same, multifocal is the most commonly used term and refers to all lenses that have multiple corrective powers for a gradual transition from near to far sight. In the sense that they provide close and distance vision, multifocal lenses are very similar to bifocal lenses, but there's a crucial difference between them. Despite multifocal being used as a catch-all term for all lenses with multiple corrective powers - which includes bifocals – there's a key difference to be aware of. Bifocal contact lenses and glasses have a clear line between near and far prescriptions, whereas multifocal contact lenses blend several powers together to cover all distances. There are two main types of multifocal lenses that offer correction via different methods. Lenses with a concentric ring design have your standard prescription in the centre with multiple rings surrounding it. Each ring has a different corrective power depending on the distance. Aspheric multifocal contact lenses blend the different prescriptions directly in front of the pupil, making the eye choose the right correction for the object you're looking at. While this might sound a bit tricky, your eye soon becomes accustomed to it and you won't even notice the difference. With concentric lenses, the distance power mostly comes predominantly from the centre of the lens. 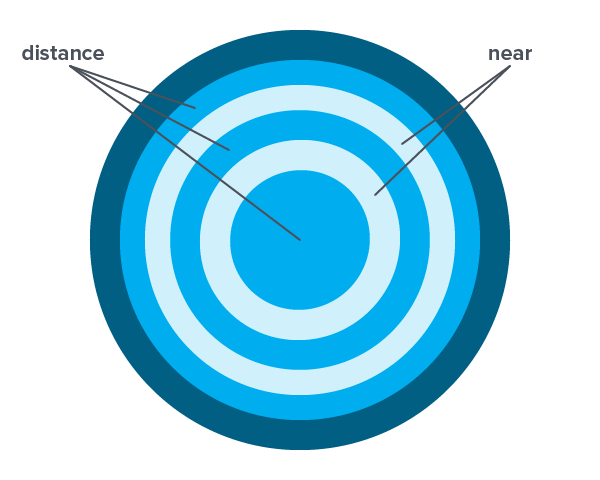 The following concentric circle provides near vision correction, the power then switches back to distance, and continues to alternate outwards from the centre. Like concentric lenses, Aspheric lenses start with distance correction in the centre of the lens. Away from the centre is a gradual transition to intermediate distance correction and then near sight correction. Watch this video for advice and tips on buying and wearing multifocal contact lenses. What vision problems do multifocal lenses correct? Multifocal lenses correct vision affected by the condition presbyopia. Presbyopia is an age-related blurring of close-up vision which usually occurs in people aged over 40, although it can sometimes develop at a younger age. It often starts off with a slight blurring before getting progressively more severe. You may have noticed friends or family who don't wear vision correction squinting to read a menu or holding it at various distances away from their face, this is a common sign that they have presbyopia. Presbyopia is a prevalent condition with the number of people affected growing every year. It's widely reported that 2.1 billion will have the condition by 2020. Unlike conditions such as short sightedness, long sightedness and astigmatism, presbyopia is not a refractive error and instead is caused by a change in your eye's elasticity. To focus light properly, your eye's lens needs to be able to relax and contract depending on what you're looking at and the lighting conditions. For you to see a clear image, light needs to pass through the lens to the cornea where it's deflected onto the retina, which then transmits the image to your brain. As you get older, the muscles in your eyes can become a little worn and so your lens will not always contract as easily, making it difficult to look at close-up objects. This results in the light not being focused on the retina, but behind them, leading to a distorted and blurry image. Why choose Multifocal Contact Lenses? If you have presbyopia, it is important to take steps to correct it. As the effects of presbyopia become more severe as time goes on, your eyesight will only get worse. Not wearing some form of corrective lens means that you'll end up straining your eyes more, causing you discomfort and possibly headaches. While bifocal contacts are one way you can solve the problem, they're not particularly common any more. It's easier to get bifocal glasses, but if you're looking for the most convenient, fuss-free way to treat presbyopia, then multifocal contact lenses are the answer. Wearing multifocal lenses means that you'll have clear vision at all distances, without the need to change into glasses or hold something at arm's length. They help to make a potentially irritating condition far more manageable and are available in a range of wearing patterns to suit your needs. If you're still unsure whether multifocal lenses will work for you, below you'll find some of the main pros and cons of the lens type. 1-Day Acuvue Moist Multifocal, from Johnson & Johnson, offer a super-convenient and hygienic solution to poor vision caused by presbyopia. It's our number one lens for presbyopia, with 17% of our customers with presbyopia choosing this lens. This is because customers value the comfort level of the lenses, which allows them to be worn for long hours without irritation. With high levels of moisture retention, a UV blocker and a 1-2-3 indicator to make application nice and easy, they're the ideal choice for new and regular lens wearers alike. These monthly multifocal contact lenses make use of TriComfort technology for an ultra-breathable lens with a thin surface that excels at retaining moisture. 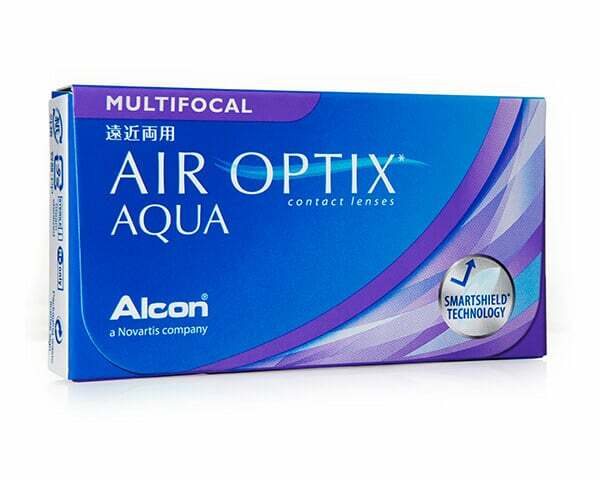 Air Optix Aqua Multifocal can be worn for up to 30 consecutive days and provide comfortable wear even during tasks that often cause eye strain. 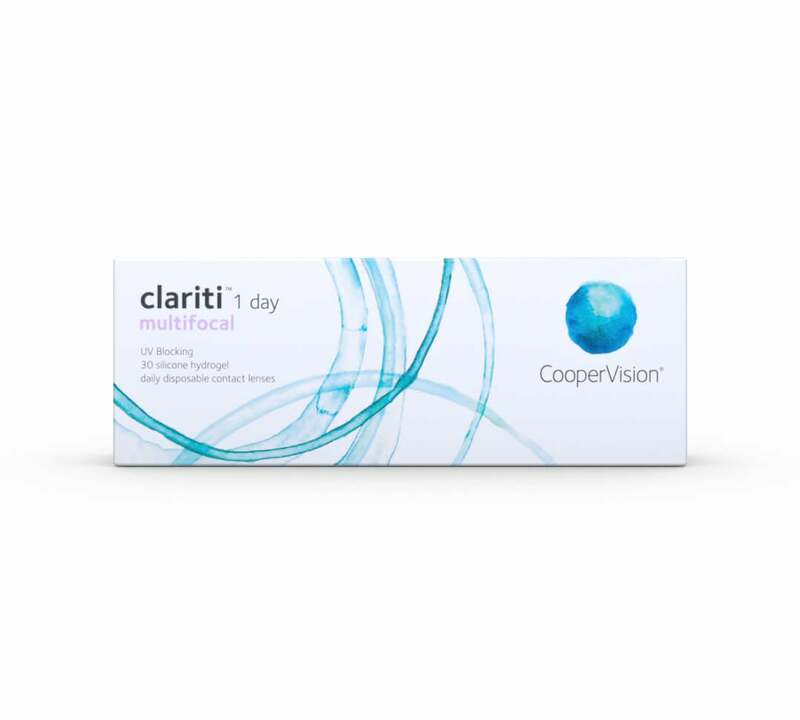 Clariti 1 Day Multifocal are daily disposable multifocal lenses which correct presbyopia. Because they are made from silicone hydrogel, more oxygen permeates the lens, reaching your eyes and ensuring healthy and irritation-free vision throughout wear. With Clariti 1 Day Multifocal you can focus on all distances easily. 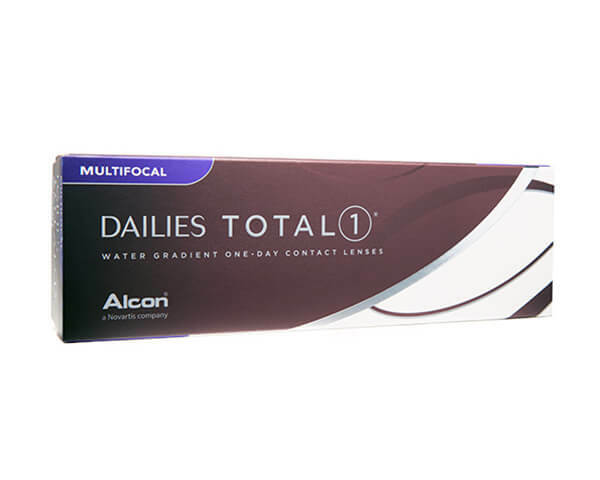 Dailies Total 1 Multifocal are the world's first and only water gradient multifocal contact lens. They have a lens surface that contains 80% water for a wearing experience that fresh, hydrated eyes all day. As daily lenses, they can be thrown away each night to be replaced the next day for high levels of comfort and hygiene. 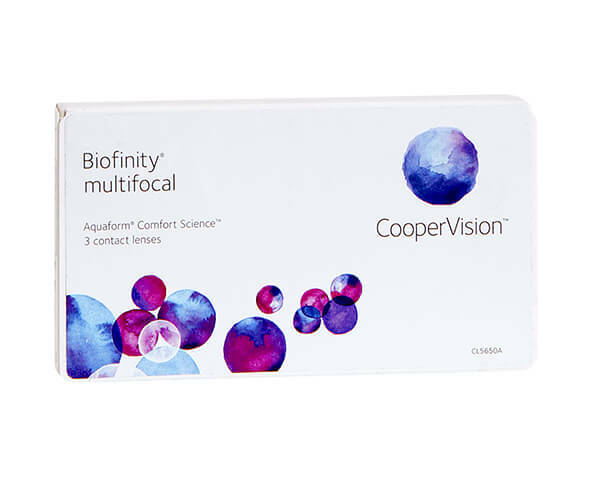 As monthly multifocal contact lenses, Biofinity multifocal can be worn for up to 30 consecutive days, remaining moist and comfortable throughout wear thanks to their high water content. Using Balanced ProgressiveTM Technology, these lenses make focusing on both near and far objects seamless for perfect visual acuity. Providing a wonderfully convenient daily option, Proclear 1-Day Multifocal contact lenses are high performance lenses that protect your eyes from irritation. Their PC TechnologyTM replicates the genetic make-up of your eye for a comfortable and natural wearing experience that is perfect if you suffer from dry eyes. 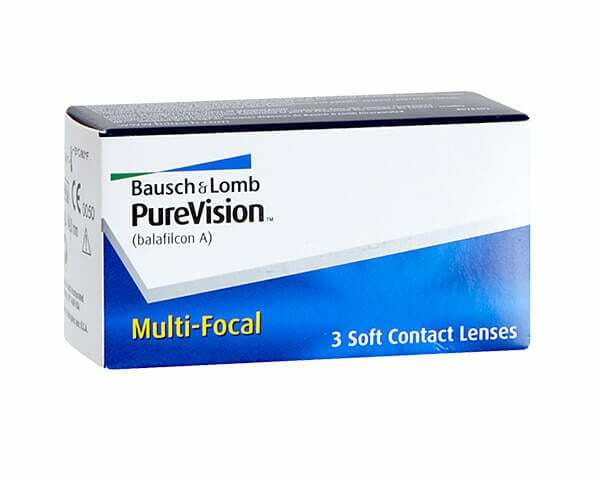 Bausch & Lomb's PureVision Multifocal lenses allow seamless focus on objects at all distances without the need for reading glasses. Made from soft and flexible silicone hydrogel, these lenses use AerGel technology for an ultra-smooth lens surface that fits comfortably on the eye. These multifocal contact lenses are the successors to Focus Dailies Progressive and offer an even more comfortable wearing experience for sufferers of presbyopia. 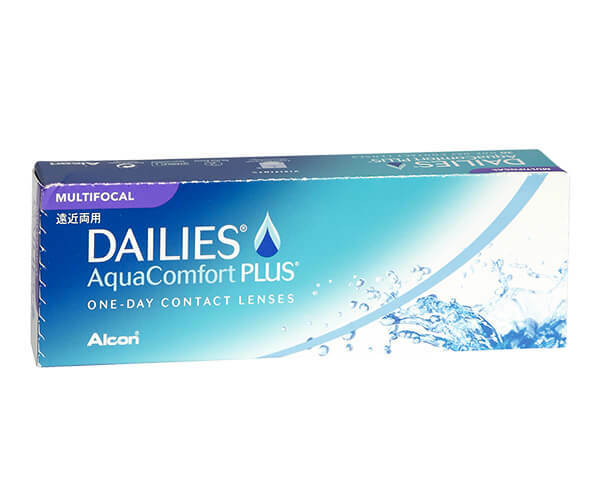 With all the best features of their predecessors and more, such as a Precision Profile design that ensures the most comfortable fit, Dailies AquaComfort Plus Multifocal are a convenient and high-performing choice. With similar technology to the Proclear 1 Day Multifocal lenses, these monthly versions offer up to 30 consecutive days of comfortable wear. 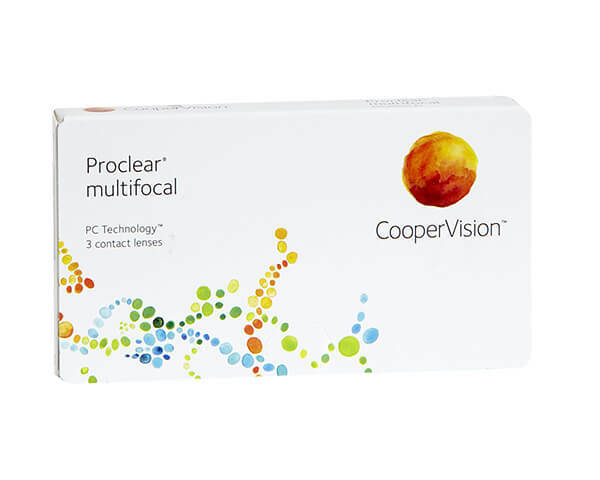 You can wear Proclear Multifocal for up to 12 hours a day, with CooperVision's PC TechnologyTM ensuring your eyes remain feeling natural while offering perfect visual acuity. If you need any advice about how to buy your contact lenses online, we're here to assist you via web chat, phone or email. Got a question about ordering from Vision Direct? Check out our handy how to guides.